Paige Mortensen is one of Vanishing Point’s most important clients. This might be surprising to some, as she is an independent artist who is having her own work framed for exhibition and sale. Whenever one of her watercolour batiks is in the shop it provokes many comments and questions from other customers, since the technique is so unusual, and the resulting work is quite striking as well as very pleasing. Paige has lived in Saskatoon since age 12, inheriting a background in math from her father and love of varied craft from her mother. She worked first as a lab technician, and later, after raising children, did accounting and technical support for twenty years. But she was always doing many kinds of craft work. She took folk art painting classes in the early 2000’s and then enrolled at USCAD in 2011. It was here that a dedicated art practice began. For the past six years Paige has been working in long series, producing steadily and abundantly. She began with images of doorways discovered on trips to Europe, fascinated by questions about who made these doors and what their lives were like. Now she brings this inquiry to prairie architecture - grain bins and elevators, old farm buildings, and later bridges, taking many photographs and then playing with them in a photo editing program. Her technique is well-suited to the subject matter - old stone, wood and brick, all highly textured, organic and worn. 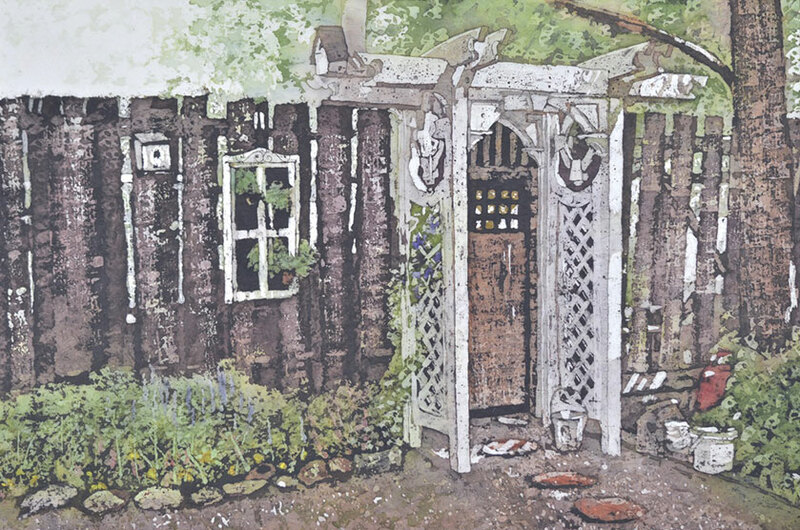 I recall one particular piece that I framed, a garden scene with a wall and gateway. The gate itself is so masterfully modelled, it’s about relative values rather than any kind of gaudy colours, the darks and lights so effectively combined in relation to each other that the gate itself has a complete sense of roundness and place, and relation to the things surrounding it, the shadows cast on it by adjacent trees and the dappled light. Maybe the shadow is so effective because it is the ultimate result of the physical structure of the painting. Paige is now working full time producing art. 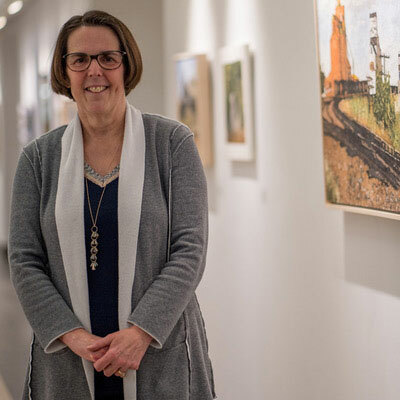 She gains exposure through the Saskatchewan Craft Council, And Art Gallery in Davidson, and the Artists’ Workshop group. She has now organized a provincial touring exhibition which is self-funded because of the onerous nature of the grant application process. With six exhibitions coming up within the next year she can feel a bit overwhelmed by the many resulting demands. She is also engaged in a CARFAC mentorship with Paula Cooley, doing more abstract and experimental work. So be sure to watch for a forthcoming collaborative exhibition. Why invest in custom picture framing? How do we Recognize Good Art?